This falls into that "I have half a bag of pita chips and no hummus so what do I do with them" situation with which I know you are all familiar. This was last Saturday morning. I was also faced with "I need breakfast and I have eggs but I don't know what I want to do with them." So I decided to put the two together. Kind of like middle eastern style Tex-Mex migas. In the most basic way possible. 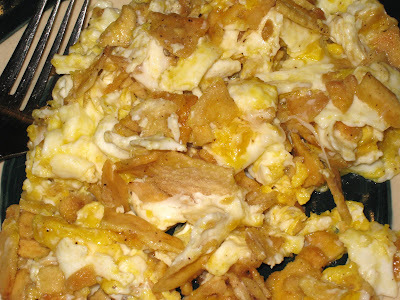 Migas usually contain onions, chilies, tomatoes and cheese in addition to the tortilla strips. Here, I only had pita chips. What made this dish interesting for me is that it brought back a method of scrambling eggs that I used frequently in the past but had all but forgotten about. Lately, I have been breaking the eggs into a mixing bowl, seasoning them and adding whatever other herbs or spices I am using along with a splash of cold water, beating them, and pouring them into melted butter in a skillet placed over a medium low heat and letting them cook relatively slowly. It's the same technique I use for omelettes. Several years ago I went through a period of laziness with my scrambled eggs. Instead of breaking them into a bowl first and mixing them up, I would just break them into the skillet over a higher heat, let them fry until the whites were just set, and then break up the yolks and scramble it all together in the skillet. It gives the eggs a completely different texture and consistency when you cook them this way. Instead of the yolk and the whites blending together, you definitely can taste and feel the difference between the two, and it somehow tastes more eggy to me. Once I decided I was going to put the pita chips in with the egg, I didn't really think about how I was going to cook them. And even though I haven't made scrambled eggs this way in years, I just started the butter melting in the skillet and brought the eggs over to the stove. I cracked them in and then sprinkled the pita chips on top, crushing them in my palm as I did so. I only added a little bit of salt (the chips were salty) and pepper to taste. I left the chips on top of the eggs while the whites set, and then stirred the whole thing together. Eggs continue cooking when you take them off the heat, so I turned the burner off when it looked like they still had about a minute to go. By the time I slid them onto my plate, they were cooked just the way I like them. This was an incredibly good makeshift breakfast. Add some other ingredients and it could be an outstanding planned event.